The NeighborHUB community grant program opened its application period for registered 501(c)(3) non-profit organizations located in Detroit, Hamtramck, or Highland Park to apply for five grants up to $30,000 and additional business support. The application period will be open until August 13, with awardees notified this fall. 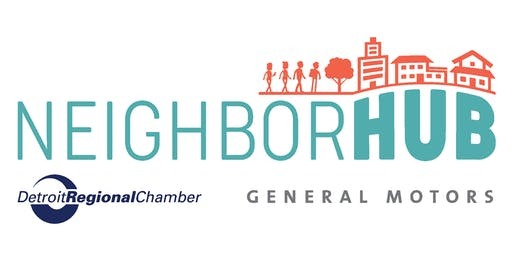 NeighborHUB is a collaborative effort between General Motors (GM) and the Detroit Regional Chamber and is designed to empower residents to affect change in their neighborhoods through a physical presence and innovative programming. The non-profits that propose the most innovative and collaborative solutions to pressing issues facing their neighborhood will be awarded a grant. “Organizations that are willing to collaborate within their neighborhood to solve problems that are most important to them should apply,” said Tammy Carnrike, CEO for the Detroit Regional Chamber. “We are looking to create sustainability within Detroit’s neighborhoods and beyond the downtown district. Successful proposals will have programming centered around a physical space and address a specific need or needs within the neighborhood i.e. a vacant storefront or within an existing building. Examples of eligible project proposals include: refurbishing a bus stop and organizing ride-sharing in that location; renovating a vacant storefront to provide services to adults to engage in education and work opportunities; building out an existing coffee shop to facilitate co-working and professional development; or improving a public park to provide after school programming. “We’re looking for organizations that are willing to collaborate with their neighborhood businesses, residents, schools, local government, and other nonprofits to create solutions to the problems that are most important to them,” said Terry Rhadigan, executive director of Communications Operations and Corporate Giving at GM. A selection committee with representatives from local organizations has been formed that will help select grant recipients. In addition to the Chamber and GM, the committee will include: City of Detroit Department of Neighborhoods, Community Development Advocates of Detroit, and Michigan Community Resources. For interested organizations looking to learn more, the Chamber will be hosting two informational sessions on Monday, July 23 at 8:30 a.m. and 6 p.m. at TechTown in Midtown Detroit. Interested non-profits can apply and learn more at: neighborhubdetroit.com.